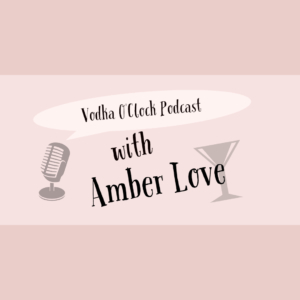 AMBER LOVE 01-FEB-2019 My work is supported by the generous backers at Patreon.com/amberunmasked who appreciate my reviews and my stories; and they also get first access to whatâs happening with my books and podcast. Also, I’m an Amazon Influencer so you can shop through my personal recommendations. 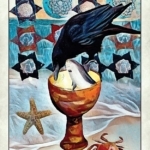 Margaux Jones Cullinane, aka MJ, is a Seattle-based artist, writer, mother, and lover of all things magical, especially crows. She attended Parson’s School of Design yet her unique technique of telling stories through digital collage is self-taught and has been her passion for over 10 years. Nature and its creatures are a familiar theme in MJ’s work, however, having grown up south of Boston her collages are heavily influenced by the energy of the city. MJ spent part of her life in New York City to attend Parsons for a while, but left early. Yet, here she is making a living as an artist full-time on her own terms as a single parent. 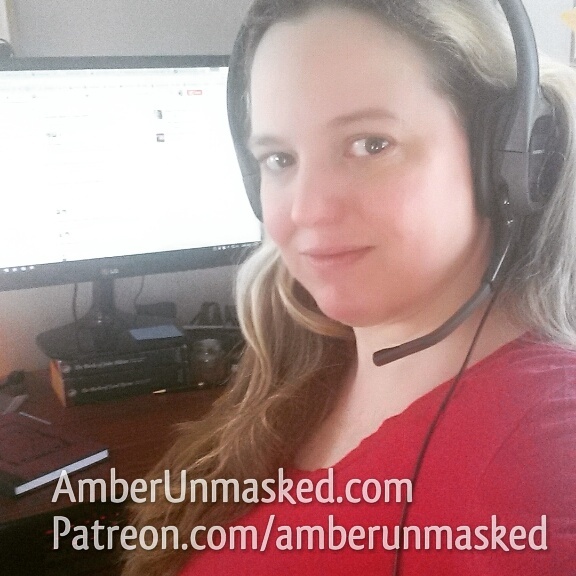 Thatâs not to say, sheâs living large because with a computer malfunction, sheâs still trying to save through her Patreon to get a robust computer. As she says, her art reflects the city of Seattle and what she witnesses in nature. 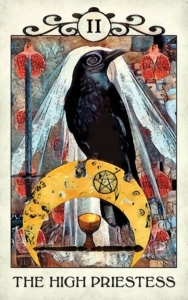 When she created the Crow Tarot it was originally going to be for her own use as a form of art therapy while dealing with life. The project wasnât going to be more than printing the art on card stock at Kinko’s. Neighborhood crows had a routine of landing and spending time on MJ’s balcony so that she could observe them up close. Since she adopted a dog, the crows havenât been as trusting. Attracting crows is something sheâs experienced her whole life. We talked about all the odd behavior weâve seen in animals: cats, raccoons, various birds, and dogs. One of the most fascinating crow facts is that they can recognize faces and pass that information along to their family. MJ creates this art with a Surface Pro utilizing a mix of drawing with digital collage. 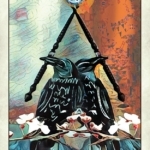 A tarot deck is typically 78 cards. Thatâs 78 separate pieces of art which required her to draw the intentions and messages through the process. We discussed the importance of having to do the business side of being an independent creator and both of us hate that part. Taxes, marketing, pitching â itâs all part of the non-art stuff. Our discussion moves into how devalued art is in the world, yet people want to enjoy it. 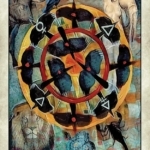 In tarot, thereâs a particular part of the history where the artistâs name, Pamela Colman Smith, was left off the formal name of the most common deck throughout history: the Rider-Waite tarot. Rider was the publisher; not too many products are referred to by their publisherâs name. People donât say, Hasbroâs Monopoly game; they simply say, Monopoly. Meier, Allison. âPamela Colman Smith, the Forgotten Artist Behind Your Tarot Cards.âÂ Hyperallergic, Hyperallergic, 27 Oct. 2016, hyperallergic.com/330790/the-unnamed-woman-artist-revealed-in-the-monogram-of-your-tarot-cards/. 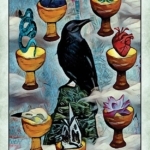 Color choices for all the suits (major arcana, cups, wands, swords, pentacles) came from MJâs environment in Seattle. She didnât limit herself to a palette specifically, but it was based on whatever was around her. Even the greatest role models are flawed. Nobody is perfect. The healing power of loving animals is potent. Hug an sweet dog. Look at cute cat pictures. They want love and survival and they donât care about your bank account, your job, your character flaws (as long as youâre good to them) or if your hair is a mess. 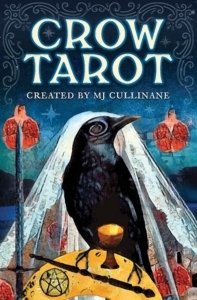 MJ herself has only been reading and studying the tarot for a year. Sheâs been going to readers for guidance throughout her life as long as she had the money for it. 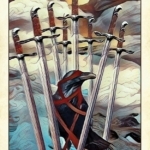 Making the Crow Tarot started when she was in a down, stressful period of life. Life was stagnant and things were not going well. Starting the deck and having a measurable goal (78 individual cards) was a personal challenge that helped her emotionally move through that period. Her other rituals include daily meditation, candle magick, concentrating on setting intentions (in yoga this is called sankalpa), burning wish papers, and putting messages into her personal Universe box (like a mailbox to the Universe that she created from a craft store shoe box). 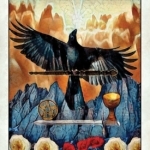 MJ is on Facebook, Twitter, Pinterest, Tumblr, YouTube and Instagram mostly on some variation of âcrowtarotâ or âcrowtarotdeckâ. Back her on Patreon at patreon.com/crowtarot.